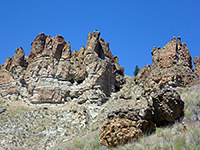 Clarno is the smallest and least interesting of the three sections of John Day Fossil Beds National Monument, and probably receives the lowest visitation of any NPS property in the West. Covering less than 2,000 acres, the preserve has a remote location in generally uninhabited land in north central Oregon, on the north side of the valley of Pine Creek, a John Day River tributary. 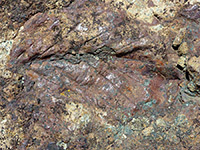 The mostly grassy hillsides bordering the creek are interrupted for a mile or so by a line of jagged, eroded cliffs - the Palisades - which contain a large number of plant fossils, including leaves, sticks and trunks, plus less common animal fossils, all relics of a time when this region was moist and well vegetated, unlike the arid, high desert conditions that prevail today. Facilities are limited to a picnic area, interpretive notices and three trails; the unit is unstaffed, and there are no large towns nearby. 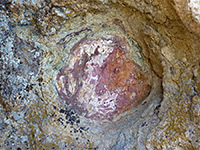 It does have a research center (Hancock Field Station), facilitating ongoing paleontological investigations, but this, and the fossil excavation sites, are not open to the public. 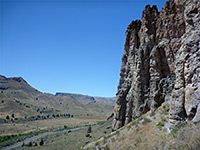 From the national monument headquarters at Sheep Rock, Clarno is reached by driving north then west along Hwy 19, following the John Day River most of the way. The roads are good, and little-traveled, passing three tiny towns (Kimberly, Spray and Service Creek) then the slightly larger community of Fossil, from where the lesser route 218 heads southwest, reaching the national monument after another 16 miles, before continuing west through more barren landscapes, over a high ridge and down towards US 97. The Clarno Unit has two parking areas, the main one by the picnic site, at the head of a small valley, and the second a little further west, beside a trailhead at the base of the Palisades. 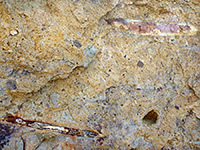 The cliffs are composed of a mix of conglomerate and more finely grained sedimentary rocks, are were formed about 44 million years ago by solidification of debris-laden mud flows caused by volcanic activity. 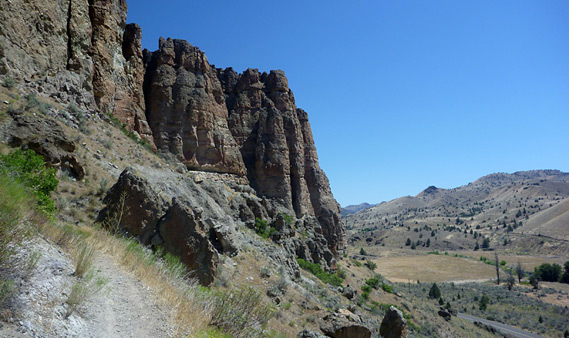 Clarno offers three short paths, all a quarter of a mile in length. 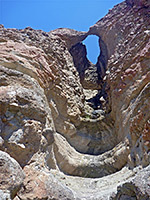 The Clarno Arch Trail climbs 200 feet towards the top of the valley, to a viewpoint below a small natural bridge, formed at the head of a pour-off from the plateau above. Erosion is steadily reducing the width of the arch, and it looks set to disappear in a few years. The cliffs at either side contain several petrified logs, up to ten feet across. 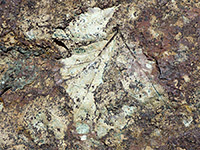 Near the start of the path, the Trail of the Fossils branches off, winding through a group of boulders fallen from the Palisades, in which are found many small leaf and branch fossils; notices indicate the main sites. On the far side of the loop, the Geologic Time Trail forks eastwards, traversing the hillside to the main parking lot.